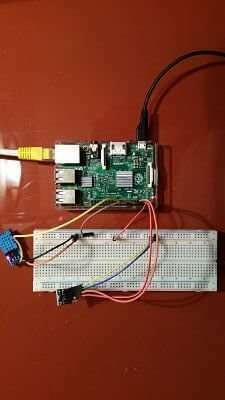 In this Raspberry Pi IoT project, we connect Samsung Artik cloud to Raspberry Pi. This guide describes step by step how to build your first Raspberry Pi project using Artik cloud platform. 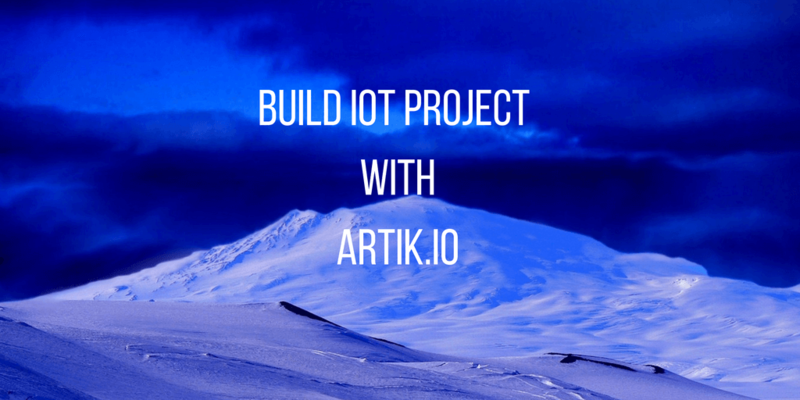 Artik IoT platform is an end-to-end IoT platform that helps us to build awesome Raspberry Pi IoT projects. It is an open platform that enables different devices to connect to the cloud. Through Artik platform, connected devices and sensors send information to the cloud. Later, application, services or other connected devices use this information according to their business requirements. As you may already know, Internet of things is the next technological revolution that will have a huge impact on our lives, so it is important to know how to design and build an IoT project based on Raspberry Pi. Before reading this tutorial, it is important you have a complete overview of what is Internet of things and how it will impact our future. how to write the application that sends data to this IoT platform. This IoT platform supports several data exchange paradigms and provides different SDKs depending on the developing language you prefer. Artik is a well structured IoT platform, moreover, Artik cloud is a well-documented platform with useful and interesting example and you can have more information at this link. An interesting aspect of this platform is the cloud API that enables external devices to connect to this platform and exchanging data. It is important you add a unique name so that your device can be identified. That’s all, you have created your first device ready to send sensor values. The next step is configuring the data model using the Manifest. This is an important aspect because it is necessary to configure in Artik the variables we want to handle in our IoT project. In other words, in this step, we are defining the basic information handled in our Raspberry Pi IoT project. These variables are sent by the device (i.e Raspberry Pi) to the cloud and they represent the parameter we measure using the sensors. Now you can activate your manifest!!! That’s all. The next step is sending the data to the Artik IoT. 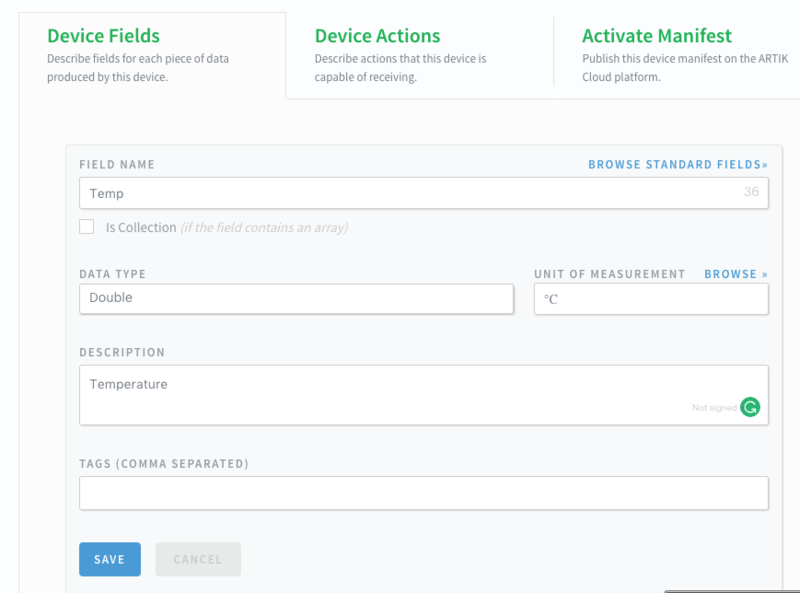 Finally, we are ready to send the sensor data to the cloud. It is important to notice that the device must be authenticated before it can send data. 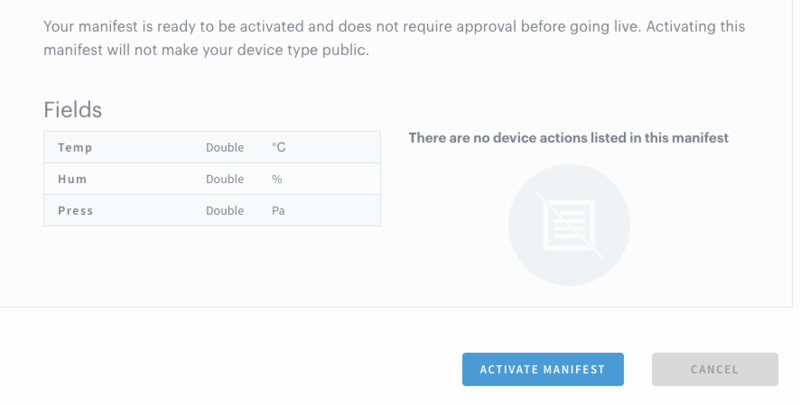 To do it, we need to use a secret token and the device Id that we get from the cloud IoT platform clicking on the device we have created previously. As you can notice as soon as the connection is established we register the device. Where sdid is the device id used before and the data is the JSON message holding the values coming from the sensors. We do the same thing for the pressure. 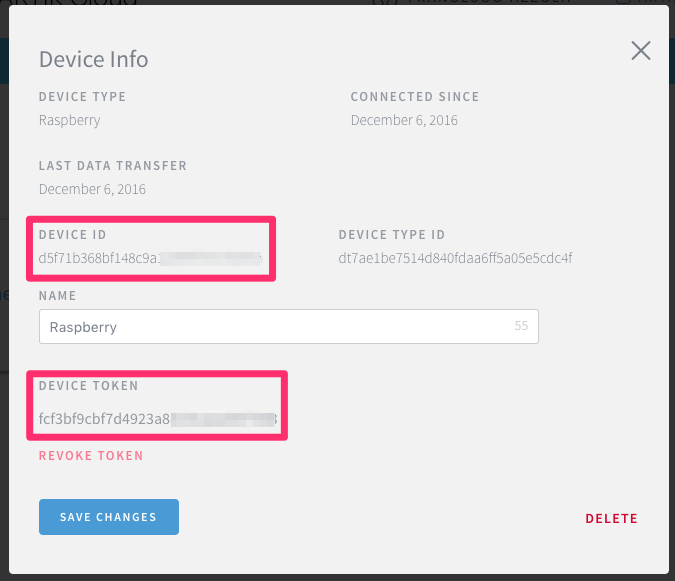 At the end of this post describing how to build your first Raspberry Pi IoT project, you gained the knowledge about Artik IoT platform and how to use it to develop a complete IoT project.